Gyoza are also called Pot Stickers or Jiaozi. They are a delicious litte package filled with meat and vegetables and cooked by both frying and steaming them. For the filling: Mix the chicken, garlic, ginger, onions, sugar, kecap mannis, cabbbage and season with salt and pepper. Keep cool in the fridge till your gyoza wrappers are ready. For the wrappers: Using the lasagna disc in the Phillips Pasta and Noodle maker add 2 phillips cups of plain flour and 1/2 teaspoon of salt and start the machine. Next using the Phillips liquid cup add 1 teaspoon of chilli oil and top up to the 190ml mark with water and drizzle into the machine. As the sheets come out cut circles quickly with a cookie cutter or glass. Place on a plate with cling film over to keep them from drying out. In a frypan pour in the 2 tablespoons of oil and heat till high. Add all the gyzo and let them fry ON THE BOTTOM SIDE ONLY till they are golden brown. Next half fill the fry pan with water and immedietly put the lid on and turn down to low. Allow to steam for 20min or till the water has evapourated. For the dipping sauce: Mix the rice wine vinegar, soy sauce and sweet chilli. Serve the gyoza with the dipping sauce. To turn this into a main dish I also served this with boiled rice and a beef stir fry. Notes... This dish is surprisingly easy and yet looks so impressive. great one to cook where is the recommend button. Do not remember having these, must look into making them. These look so delicious! Gyoza are one of my favourites! definitely a favourite at our house! What an awesome recipe! These look amazing! Oh drool!!! I LOVE pot stickers and these look delicious. Pamela, when are you inviting me to dinner?? A wonderful recipe; thanks for sharing!. They look absolutely divine! Well done! How delicious. Will be trying this out. 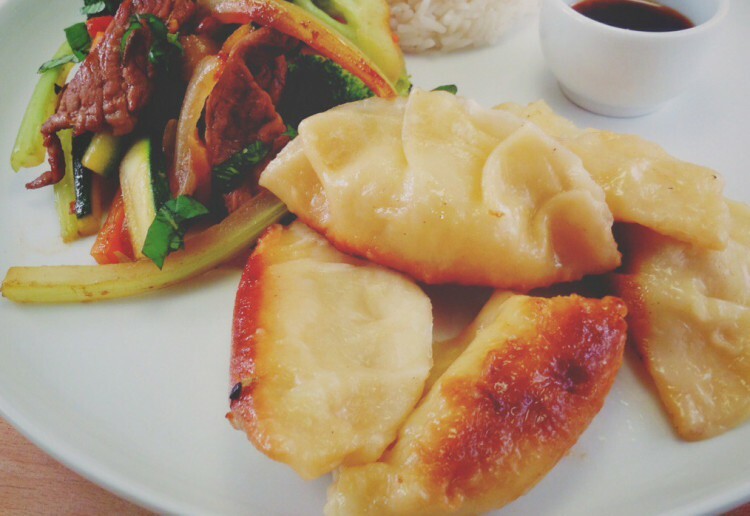 The Gyoza parcels would be gone very quickly in our house,great recipe! Wish someone would make me some now. Oh my how I do love Gyoza’s!